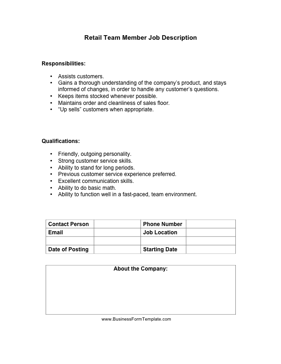 Perfect for clothing and department stores, this job description can be used as an advertisement for a retail team member. Gains a thorough understanding of the company's product, and stays informed of changes, in order to handle any customer's questions. Keeps items stocked whenever possible. Maintains order and cleanliness of sales floor. "Up sells" customers when appropriate.